The unique aluminum substructure and custom made glass surface combine to create the future of sports flooring. Constructed using glass, ceramic and aluminium the ASB GlassFloor is engineered to last. 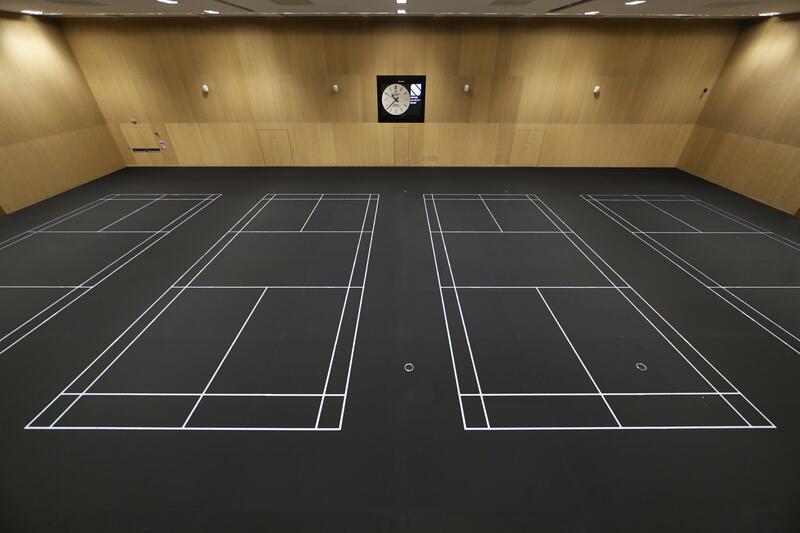 The ASB GlassFloor also exploits modern LED technology by positioning line markings under the glass surface, meaning a single court marking can be illuminated at a time. Alternatively a full LED sub structure can also be positioned under the glass surface to provide an incredible visual experience. The sub-floor consists of a flat aluminium grid that acts as a double spring. The glass is then laid on hard rubber bar rings on top of the elastic double layer subfloor. The combination of subfloor and glass allows for equal elasticity and shock absorption across the whole surface. The ASB GlassFloor is constructed using glass, ceramic and aluminium, all materials that are known for their toughness, resistance to climate, corrosion and age. The consequence is a floor that has a life expectancy in excess of 60 years, far beyond the life of any other sports floor. Over a 60 year period a typical 600m2 timber sports floor can cost in excess of £340,000. This includes a replacement floor together with periodic, sanding, sealing and line marking but excludes the day to day maintenance regime. The ASB Glassfloor only requires a day to day a maintenance regime and no refinishing throughout its life. With the ability to illuminate a single court at the click of a button the ASB GlassFloor can be instantly cleared of unnecessary markings and transformed into a single sport arena, eliminating the need for expensive matting or complex portable floors for hosting high profile sporting events such as international competitions. The durable glass surface of the ASB GlassFloor is capable of accommodating non-sporting events without the need for surface protection and has the ability to withstand exceptionally high loadings. The ASB GlassFloor is able to incorporate LED panels which can utilised in a variety of ways, including scoring, advertising, branding etc. The Glass is constructed using 2 layers of laminated safety glass. Each glass layer is 5mm thick and both layers are connected with a PVB foil, 1.2mm thick. The surface is then etched to prevent the reflection of light and burnt in ceramic dots are applied to provide the required slip resistance.